It’s an exciting time when your client is psyched to get the most competitive underwritten rates for their upcoming renewal. This guide will step you through the PHQ process and give you some tips on best practices we’ve seen along the way. The biggest challenge to get through this process always boils down to one thing: a battle against employee inertia. Be prepared to expend 90% of your efforts on getting the last 10% of applications completed by employees. Make sure your client is aware and prepared to help you get all health questionnaires because you run the risk of employees without PHQs being denied coverage or the entire group being re-rated. Employee communications should come from a member of your leadership team as this will produce the fastest response. Do this as early as you can afford to and don’t let time make the renewal decision: Include a deadline that’s about a week in advance of your real deadline so you don’t run out of time. Prepare your employer and your employee population on what to expect in this process. 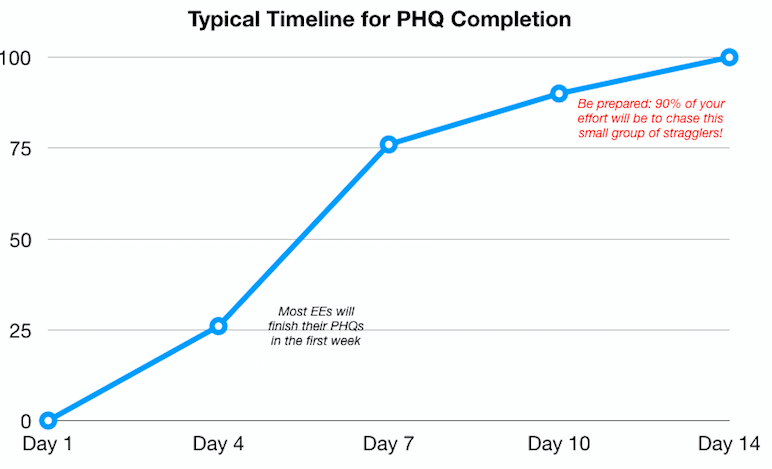 Our FAQ for the PHQ process is the a great place to start. Step 1: Start by reading this FAQ for employees on Personal Health Questionnaires (PHQ) that will be helpful for you too. In order to bring you the best value from our health plan possible, we will need every employee to complete a Personal Health Questionnaire (PHQ). Its sole purpose is to help potential health insurance carriers to assess our risk as a group and determine appropriate premiums. If you do not complete your health questionnaire by 5pm Monday 6/5 you will be NOT be eligible to enroll medical benefits this year. Completing a questionnaire is NOT a commitment to enroll in benefits; you can waive benefits later when it’s time for open enrollment. Your privacy is of utmost importance, which is why we are using an outside service to gather this information. No employee of [Company Name] will ever be able to view this information. This includes employees in human resources and finance who administer the health insurance plan for the company. Or read more about the process here. Health Report - for a spreadsheet download of the health conditions reported by your employee population. Yes, all the information provided on Allay is transmitted using end-to-end encryption (SSL) and the relevant industry standard practices. Read more about our security policy here. Yes, Allay is fully HIPAA compliant; you can read more about our privacy policies here. At no time, will an employee of the group (even employees of finance, human resources or CEO) have access to another employee’s personal details or medical history on Allay. What should I do if I my group runs into technical issues? What do I do if an employee says they completed their questionnaire but I show them as having an incomplete status? You should ask the employee to forward their email confirmation to prove they have completed their questionnaire. If they don't have this email receipt, there are steps they still need to complete in Allay. Have the employee log in again at app.allay.io. What do I do if an employee says they need to make changes after they signed their PHQ? Head to broker dashboard and click on "Assign and Track PHQs" for the group. Select the employee who has requested to make changes to their PHQ. From there select Request New Signature from the dropdown menu. This will erase the signature that was applied to the PHQ and allow the employee to go in and change their answers and re-sign the forms. Note: an email will be sent out immediately to notify the employee.